Witty Peter Kreeft writes engaging and thought-provoking dialogue. Exceptional presentation of Machiavelli, his arguments, and the arguments against him. Funny in some parts too, especially when Machiavelli starts sulking. The refrencing of contemporary cultural icons by Socrates would, without fail, make me crack a smile. 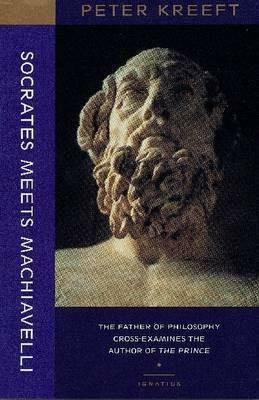 It was also interesting to read the historical facts that would invalidate Machiavelli's arguments.If anything, I would only criticize the apparent excessive bias of Socrates and the ending.The original Socrates at least tries to sound unbiased (although I would agree he is not) but he manages to take down others by simply questioning them. In this book I can count more than one instance where Socrates makes a claim that is not the result of the questioning, although these claims are reasonable from my perspective. Stylistically this was only faintly off putting. It was also disappointing, since a win In the traditional Socratic manner would have been incredibly more impressive. Yet, it might be more off putting to those of non-Christian persuasion or of Machiavellian bent since usually the claims are from the perspective of a newly Christened Socrates. Also the ending was very abrupt. While I agree with Socrates, again I feel it was more like a powered take down of Machiavelli because the book just had to end somehow. Kreeft makes use of the ultimate reality that all will die and that God exists (which needs no discussion in the book since they are in purgatory) to unravel Machiavelli at the end. Which doesn't make sense since I thought we had established that Machiavelli though himself as an agnostic/atheist(even in purgatory). Socrates's words at the end shouldn't have had much impact. There were other minor contradictions within Machiavelli's words and what was brought up (for example he once agreed with Socrates that his principles could be used in businesses, and then he says that the principles weren't made to be used in businesses, but I digress) The book was also slightly repetitive. While it would help people learn the topics more, it still became boring. Even Machiavelli seemed to take note of the lull and complained that Socrates "wasnt getting to the point fast enough" (Im paraphrasing).However, it's still a useful read if you want to crack The Prince open. Funny and fun. Contrasts ancient and modern philosophers, showing all categories of philosophy touch each other. It's impossible to do ethics without addressing metaphysics, anthropology without epistemology, and so on. This was Machiavelli's crucial fallacy, which has cost the modern world deeply. We must recover this interconnectedness of reality from the ancients if we are to make progress in political theory. Bang! That is the sound of one of the "Great" philosophers, who, continues to hold sway today, running into the wall of logic. Kreft really does dissect the essential tenets put forth by Niccolo. Mind bender to get your gray matter into the setting and conversation. But once you do, it is a fun and interesting ride. Peter Kreeft - Peter Kreeft is a Catholic apologist, professor of philosophy at Boston College and The King's College, and author of over 45 books including Fundamentals of the Faith, Everything you Ever Wanted to Know about Heaven, and Back to Virtue. Some consider him the best Catholic philosopher currently residing in the United States. His ideas draw heavily from religious and philosophical tradition, especially Thomas Aquinas, Socrates, G. K. Chesterton and C. S. Lewis. Kreeft has writings on Socratic logic, the sea, Jesus Christ, the Summa Theologica, angels, Blaise Pascal, and Heaven, as well as his work on the Problem of Evil, for which he was interviewed by Lee Strobel in his bestseller, The Case for Faith.